Perch and Walleye Cabins: Open – Cabins with Heating and A/C units are open year round. Gates Close at 10 pm Friday and Saturday night and open at 7 am. Quiet Hours are from 10 pm to 7 am ever night. That means no music, generators, or excessive noise. Dogs have to be on a leash at all times or contained in a dog pen area. NO GLASS CONTAINER OF ANY KIND ON THE BEACHES. Citations will be issued for all these violations. OHV speed on all road ways in the park is 15 mph. 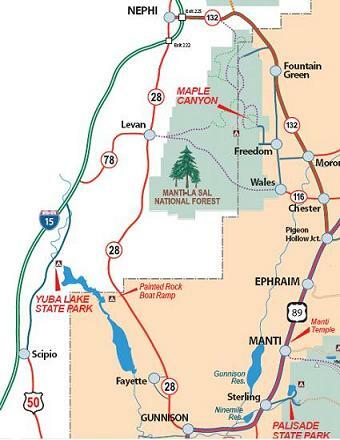 Yuba Reservoir is located approximately 30 miles south of Nephi, just off I-15 on the east side of the freeway. It is located in a long, narrow valley between the Valley Mountains and the San Pitch Mountains, between Gunnison and I-15. The reservoir shoreline is about 50% privately owned, with BLM comprising the remaining 50%. Public access is unrestricted. 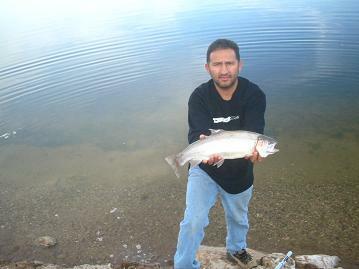 Yuba Reservoir is accessible from many points on U-28 north of Gunnison, as well as from old US-91 north of Scipio. Northern accesses are favored because the south end of the reservoir is often shallow or dry. Old US-91 passes by Yuba Lake State Park, near the dam. Exit I-15 at exit #202? (old exit number) and go south, or exit at #188 (Scipio), and take the frontage road on the west side of the freeway which intersects old US-91 via an underpass a few miles north of Scipio. There are numerous accesses along U-28 from about 15 miles south of Levan (Painted Rocks access) to near Fayette. Access is also possible from a network of unpaved roads on the west side of the reservoir.